The “Mednorth-Tehnics” company is specializing in producing and selling medical equipment. The main focus of the company are compexes for clinical diagnostic analysis of the rheological properties of blood: piezoelectric and electrical thromboelastography. On this website you can find information about our last device – ARP-01M «Mednord». The ARP-01M “Mednord” complex is a piezoelectric tromboelastograph which operates with the whole blood and does not require chemical reagents, and is designed for the research of the rheological properties of blood, control and registration of the very insignificant changes of the aggregative state of blood or plasma in the process of their coagulation, calculation of the amplitude and chronometric constants, determination of the intensity of the processes which characterize the main stages of hemocoagulation and fibrinolysis. The novelty of the proposed instrumental method of coagulometric studies is that it allows to investigate the vascular-thrombocyte and coagulation components of hemocoagulation in their interconnection with obtaining the data on the functional status of the hemostatic system. Competitiveness of the ARP-01М “Mednord” complex. 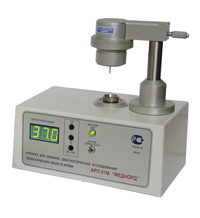 High sensitivity, calculation of indicators on-line, scaling of any parts of the graph, and standardization of research makes it possible to use the ARP-01М “Mednord” for evaluation of distortion of all components of the system of regulation of the blood aggregative state at the clinics of various types. The “Mednorth-Tehnics” company is a reliable guarantor of the quality and support manning of the high-tech medical products offered. The “Mednord-Tehnika” company is a reliable guarantor of the quality and support manning of the high-tech medical products offered. November 16-19 2011 "Mednorth-Technics" took part in international exposition "MEDICA-2011" in Dusseldorf, Germany. "Mednorth-Technics" LLC have opened english version of the website. You can find all important information about ARP-01M "Mednord" complex on it.